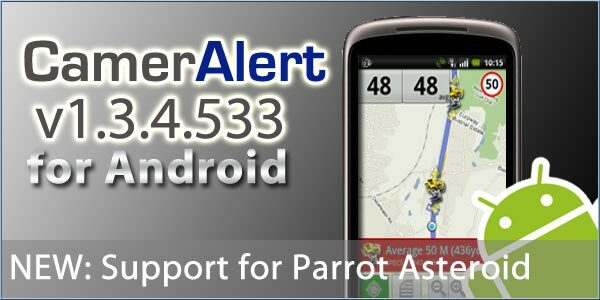 We have just released CamerAlert for Android version 1.3.4 build 533 into the Android Market. It may take a little while before it becomes active, after which you should now be able to upgrade the application through Market and benefit from the new features and bug fixes we have implemented. Fix where decimal point on KM was out by factor of 10. Fix where preferences were not properly initialised. Fix where there could be a crash if the database is empty when adding a camera. It's there now, mine updated at about 4.30pm this afternoon. & the upgrade terminates, any suggestions? You could either try later in the day to see if it has resolved or maybe reset the phone (complete power off and turn back on). Also make sure the date/time are correct on the phone etc. Installed OK on my HTC Sensation on Android 2.3.4 in the last few minutes. All looking well at the moment and it's showing the 2 mobile sites that appear now and again outside our offices. Thanks for all the good work guys an d Happy Christmas to everyone. Ric - TomTom 520 DEAD - Passed to the great traffic jam in the sky. Now using Maps & Waze on Samsung Galaxy S4 + CamerAlert of course! Flip back to the Market / Upgrade screen & set it going. NOTE: All this is assuming that the Market continues only to offer the old version for clean installs as it did with me this morning! "Read Phone State and Identity - Allows the application to access the phone features of the device. An application with this permission can determine the phone number and serial number of this phone, whether a call is active, the number that call is connected to and the like." Seems particularly intrusive. Could you explain why this is needed. we are reading the phone IMEI (if available) and use that as part of the unique identifier for your device. We are not using the IMEI directly, instead we create a hash from it. We do not use any of the other phone functions.